In a large saucepan, combine the stock and garbanzo beans. Bring to a boil, reduce the heat, and simmer, covered, for 1 hour, or until just tender. Drain, reserving 1 cup of the cooking liquid. 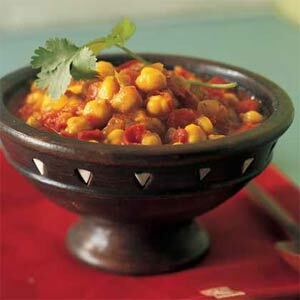 In a large saucepan, combine the cooked garbanzos, reserved liquid, onion, tomato, ginger, coriander, garlic, and cumin. Bring to a boil. Reduce the heat and simmer, covered, for 20 minutes. Season to taste with freshly ground black pepper. Garnish with the lime juice and chopped parsley. Serves 4.